With Thanksgiving around the corner, you might find yourself with an abundance of cranberries on hand. Cranberries are a beautiful addition to any dinner plate. Their rich color dresses everything up and adds a touch of complex sweetness. Cranberries are also extremely healthy—they are chockfull of antioxidants and proanthocyanidins (or PACs) that help to prevent the adhesion of certain of bacteria (these anti-adhesion properties inhibit the bacteria associated with E. coli, and potentially those associated with gum disease and stomach ulcers as well). 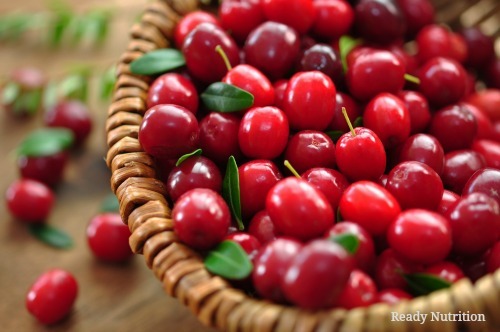 Cranberries are also rich in phytonutrients, giving you an upper hand at combatting various illnesses. Women have long-been using cranberry juices and extract to treat and avoid urinary tract infections. With Thanksgiving around the corner, you might find yourself with an abundance of cranberries on hand. Resist the urge to make typical cranberry sauce and call it a day–the following recipes show a few exciting ways to change things up. And don’t limit yourself to the holidays! These dishes taste great year round. This recipe is a kind of adult version of the classic cranberry sauce. Tasty and colorful, if you make big batches you can put them in mason jars for beautiful holiday gifts for your friends and neighbors. Combine sugar and red wine in a medium saucepan. Bring to a boil over medium heat. Add the cranberries, cinnamon stick and orange peel. Reduce heat and simmer, stirring often until most of the cranberries have burst (about 15 minutes). Remove from heat and chill before serving. Again, this is a bit of a more festive take on classic cranberry sauce. Perfect with turkey and other holiday dinners. Combine all ingredients in a large saucepan; bring to a boil. Reduce heat; simmer, stirring occasionally, for 5 to 8 minutes, or until cranberries are bursting. Chill until serving time; freeze surplus in small containers. Wheat berries are a versatile whole grain. Learn more about how to use them here. For salad: In a large bowl, mix together all ingredients. For dressing: In a small bowl, whisk together ingredients for dressing. Pour the dressing over the salad and gently toss. Refrigerate the dressed salad to allow the flavors to meld before serving. Serve it cold or heat it up for a breakfast cereal. The stronger cranberry flavor plus cilantro in this dish is a real compliment to the quinoa, which can be a bit bland. Note that the cranberries used in this recipe are dried. Pour the water into a saucepan and bring to a boil over high heat. Pour in the quinoa, cover with a lid, and continue to simmer over low heat until the water has been absorbed (about 20 minutes). Scrape into a mixing bowl and chill in the refrigerator until cold. This is a delicious and easy way to prepare chicken breasts. The cranberries add a welcome change to our regular chicken dinner, and I love using the crockpot to prepare meals during the week. Place the chicken breasts in the bottom of a slow cooker. Pour the salad dressing, cranberries, and onion soup mix over the chicken. Cook on Low 4 to 6 hours.